I was down in Maryland for the day, covering a soccer match for my newspaper, The Press of Atlantic City. Our own Ocean City Barons (an amateur team in the USL) was playing against D.C. United. These types of matches don't happen every day, so it was a pretty big deal to the people down in the area and for the players. The players are made up of mostly college-aged athletes with a couple of older guys and even one high school senior. They ended up losing 2-0, but they played well. D.C. United didn't score until the 75th minute on a penalty kick. The second goal was given up very late in the 93rd minute. 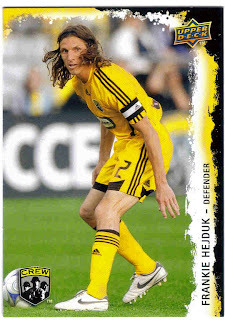 While I was at the game, I decided to pick up a $2 pack of MLS cards. You can 10 cards per pack and with a chance at a jersey card. Jersey cards fall three per box, according to the advertising on the box. Nice pulls. Can't go wrong with a jersey card. I've always wanted to pick some of them up but can't find them anywhere by me. Not sure I want to the bad enough to pay for shipping on eBay though. I'm assuming that the soccer match was a part of the Hunt US Open. 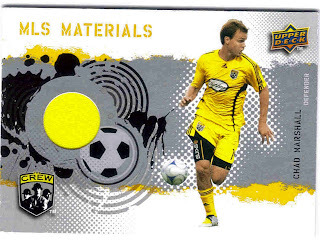 I've never seen MLS cards either, but it wasn't like I was looking for them. I thought for $2 I couldn't go wrong. 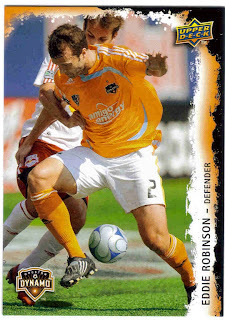 It was part of the US Open Cup. 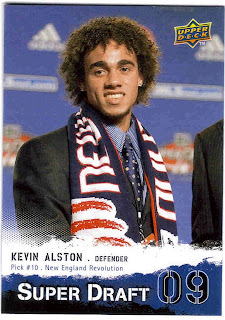 Wasn't Kevin Alston on American Idol a few years ago?